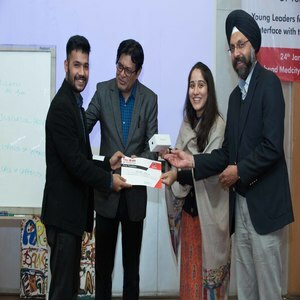 BML Munjal University (BMU), founded by The Hero Group, with strong international collaborations and dedicated to provide global quality education, launched an online innovation contest titled “Heroes of Tomorrow” (www.bml.edu.in/heroes-of-tomorrow). The contest saw participation from all over India and beyond. The contest hosted a final round on the contest in the capital on 24th January 2017. Heroes of Tomorrow was open to students across streams in class XI and XII and encourages students to think creatively about the problems, apply their theoretical knowledge and create connections across disciplines and subjects. The contest was launched in October 2016, and invited students of class XI and XII to share ideas based on the theme “One idea which could change the future”. There have been close to 2000 entries from all over India and beyond. Every week, the winner with the most innovative idea was declared - the 7 weekly winners received Virtual Reality (VR) glasses. 25% of the entries received have been shortlisted for Round 2 of the contest. The two-phase format selects the most promising ideas received and invites the participants behind those ideas to build them out in more detail. Interestingly, a significant proportion of the entries have been received from Tier 2 and Tier 3 cities in India. In the final round, the top 5 entries were judged by a panel of judges and the winner of the contest was Hardik Minocha, a class XII student from Ryan International School, New Delhi. His idea was ‘The Mechanical Defibrillator’ - a step towards saving lives of people who can’t afford to buy current existing defibrillators - which are extremely expensive and require electricity to function. Hardik received an iPhone and seed money to start building this idea into a workable product. The runners up in the contest were awarded various innovative gadgets. Commenting on the contest, Mr Akshay Munjal, President, BML Munjal University said, “Globally, Innovation is recognized as one of the top priorities for economic and social growth. In today's competitive world, successful innovation requires more than just a creative idea. While much progress has been achieved in the recent past, industry and policy makers still face challenges in the pursuit of innovation. At BML Munjal University, it is our endeavour to nurture talent and impart amongst our students the conviction and strength to execute their ideas with courage and perseverance." The contest celebrates the power of ideas and is an effort to lead the momentum of innovation and how it can be applied to bring about desired changes the world. The contest will provide a platform for participants to seek inspiration in innovation and demonstrate their abilities to analyse problems and come up with out-of-the-box and executable solutions for them.